Saying that this is a long overdue post really is an understatement. I was featured in the July 2018 issue of the Malay magazine, Nona and actually got the magazines around 5 month ago and I checked the date I took photos of the said magazine (which I'm sharing here .. and it was 6th July 2018! But because I have been sick and unwell and tested with a different set of illnesses these past few months, I was not able to share this post. I really thought I could have shared it and then I was unexpectedly away from social media for about 3 months to focus solely on my health since the end of June. I didn't think that I would be away that long but it was what was required. Anyways, I did this interview on 16th May 2018, right after Mother's Day. This is one of the interviews that I'm so very happy, grateful and glad that I did. Initially it was supposed to be just an interview for their offline magazine and then suddenly after the shoot they said that that they would want the editor of Nona Kiffy Razak to interview me on video for their online magazine too. It was really surprising (I'm not much of a fan of surprises) and I did not know what the interview was going to be about but I really had an amazing time with the interview + shoot with Kak Maizan (Hamizatul Maizan) and also doing the the video interview with Kiffy and just like the one I did back in 2013, they made me so comfortable to share something so so deep and personal about myself. It really is a surprise and this video interview was 100% unplanned but I think its one of best interviews that I've ever done in the sense that I felt it was so personally satisfying to open up, share and it was so spontaneous. I shared about my grief, I shared about my pain, and I shared about the realisation that letting go and moving on does not mean erasing the memories of what you have. 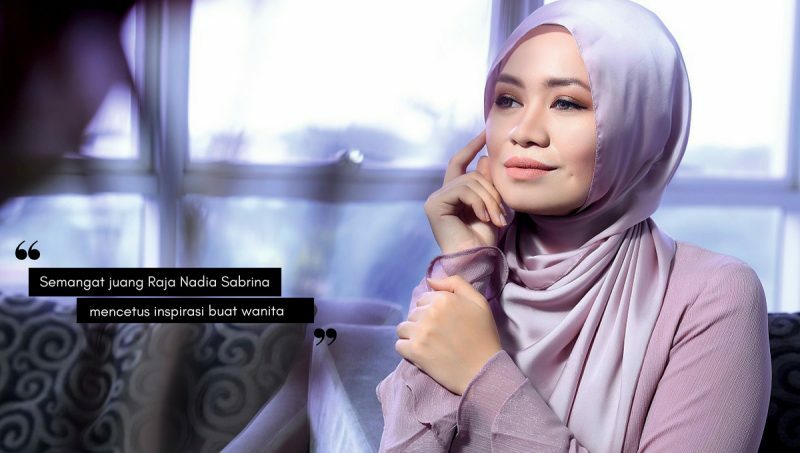 Here's the link to the video interview on YouTube INSPIRASI NONA BERSAMA KIFFY RAZAK - RAJA NADIA SABRINA (just click the title) and below is the summary of the interview in my own words. Most of the interview was done in the Malay Language so I try to translate it here for non-Malay speaking readers too. When Kiffy started off the interview with the first question: "Throughout your journey of life on the face of this earth..." I immediately knew that this was going to be a deep kind of interview already! Then he continued, "are there any secrets as a woman, of course a secret is meant to be private and personal but are there any that you can share with the readers that you haven't revealed?" Wow. What a question. I had no idea but I did not even pause to answer that question. I went on to answer the question by saying that I opened up and shared with Nona in 2013 when my first child passed away and left this world. I shared about her loss but what I didn't share is what I went through at that time. My firstborn daughter passed away 5 years ago after living and fighting during the time she was in me as well as when she lived outside of me for 12 hours. But what I didn't share was that I basically isolated myself without realising it. I was grieving and hiding in a cocoon from the rest of the world. A lot of people asked me what I was feeling, how I was feeling, they wanted to know what I went through and some even wanted to interview right after the loss for a parenting magazine and what not but I couldn't. I couldn't share because it was too painful and even the questions itself left me in so much pain too. Some of the things that I went through were really traumatic especially in the hospital and it wasn't easy for me to talk about or write about. Even until now, there are still a lot of things that I haven't shared and most of the things shared are just still on the surface. So I became a quieter shell of myself and slowly, I stopped replying to the questions and shut myself out from the people who tried to reach out to me. Or sometimes, even a simple and innocent "how are you?" left me in tears. I remember a lot of people didn't want to ask me how I was after that to avoid triggering my emotional responses and to stop me from crying, some doing that because I specifically asked them not to. It was a difficult time for me these past few years but as I was doing this video interview, after 5 years, I could slowly open up about it. Then his second question, "can we touch again on that moment, rewind, if you don't mind and are emotionally stable now? I was there when you shared about your loss all those years ago but maybe some would have forgotten or may not know about it. Can you revisit and cover a little on the events that happened at that time?". It was 2013, 5 years ago, I was in the hospital for 78 days fighting to give my daughter a chance to live after PPROM with the help of an amazing medical team, things were going quite well before she was ready to come out to our world. I gave birth to her via emergency c-section and it was a beautiful delivery. But after 12 hours of fighting, she left this world. No mother or father would ever expect his or her child to leave this world before them. For me personally, I would never ever expect that I would ever have to visit my own child's grave. For me, my child should be visiting my grave, not the other way around. That was 5 years ago. And actually when nona first interviewed me, it was for Mother's Day issue (read : FEATURE IN THE MAY ISSUE OF NONA MAGAZINE : MOTHER'S DAY EDITION) and actually Nona did tell me they were interviewing me for Mother's Day but they didn't ask me to talk about my experiences becoming a mother. They were sensitive enough to not push me to share, but told me that I should only share if I was okay to, but if I wasn't it's okay as well. It was just a few months after my loss and at that time I was still in my own cocoon, after 78 days being confined in the hospital, I returned home without my baby and I didn't go out from my house for the longest time. My family and closest friends tried to gently persuade me to go out and going to the Nona interview was one of the ways they tried to encourage me to go out. I am thankful for my cousin Zara (Putri Zaralisa Adril) who was there to accompany me at the interview in 2013, styled me with her scarves, helped me dress up and my cousin Cho (Putri Azalea Ramli) for the Pu3 clothes I wore. At that time I still questioned whether it was the right thing for me to do that interview, but I'm actually very happy that I shared what I shared to Nona in 2013 because now when I look back at that issue I can see her name there too. Her name is Putri Jibrael Zumirrah and her name is printed there. Not as though she didn't exist. Sometimes when I bring up her name, people look at me as though I'm crazy as though she didn't exist and that we shouldn't be talking about her but she exists, just not here in this world but in a much better world we can only dream and try our best to go to. For me, someone who has lost 2 children in different ways, I feel like this is what the majority of people don't know or understand. Sometimes people think that if someone has lost a child, the best thing to do is not to talk to that person or avoid saying anything that may trigger their pain, don't bring up their child's name, don't say Happy Mother's Day to them because it might be painful for them, but actually personally for me I would appreciate it so much if people included me too when they wish happy Mother's Day, or bring up my baby's name eg Jibrael, and offer consoling words of encouragement like Jibrael kat syurga (in heaven), insyaAllah she will pray for you over there, share Hadiths (as our Prophet Muhammad lost some of his babies too etc (Alhamdulillah for those who did that to me the past few years). I can't deny that Mother's Day must be one of the hardest days to go through (of course there are many other difficult days as well) as a mother to children in heaven. It's tricky because when people think that it's easier not mention or ask her about it because she will be sad, it's true what they think because it's impossible not to be sad when we think of our loved ones who have left us. But in our hearts and at the end of the day I will usually feel that those who made an effort to remember our loved ones are the sweetest and in my heart I will feel like "awwww, they remembered" and thats one of the greatest feelings for me. To know that there are others who acknowledge their existence and remember them in their hearts too. It's the same thing with Nona's coverage when I had my first child, I feel that its so sweet to have her name there even though she no longer lives in this world. Then for the 3rd question Kiffy asked: "What can you learn from all the pain and suffering from what happened 5 years ago, how do you move on and what have you achieved"?. What I've learned from what happened 5 years ago, mainly are these two things: Strength and patience. When initially everyone told me to be strong and stay strong, I didn't feel it. I didn't feel strong at all. I felt like crying all the time the more people said that. But there are times recently that were hard too like during Mother's Day even when people saw that I was okay, smiling on Instagram or in public all the time but there was a moment when I was alone and I remembered the moments of loss even more and I was crying behind closed doors for the longest time, even after 5 years. But of course, my first child made me a mother. Its an unbreakable bond. But, for me strength does not mean you cannot cry. It's okay to cry as long as you don't like scream in public or anything like that but sometimes crying is exactly what you need to release your feelings, your pain.. and then after that you will be okay. Because crying does not mean that you're sad. Sometimes it just means that you miss someone and the thing is, missing someone is not a crime. If you don't love that person then you don't miss that person. I think other people might relate with this if they have lost someone that they love, maybe a friend or a family member. So actually, it is not wrong, it is okay to cry sometimes. But for the longest time, I felt like it was wrong so many times, I judged myself for it but I'm glad that through time I've learned that its not wrong and its even unhealthier to keep things bottled up and not actually expressing your feelings. Then Kiffy's fourth question, "So that's a little memory in your journey of life that you've shared and Allah has now blessed you with a more complete life for you and your husband, do you think they understand what went through?" I answered, Alhamdulillah. And no, my 2 children don't understand yet because they are still babies but I am so extremely grateful for the gifts from Allah in the form of my children who are both here with me and my husband in this world right now, Elhan and Evren. They are really the joys of my heart. They're everything. I didn't expect them at all when I lost my 2 children. Of course at times I felt like there's hope, but there were a lot of times that I felt like there was no hope at all. I didn't know what was going to happen. With their presence and them entering my life, I just feel so even more blessed and thankful. Allah planned something that I did not foresee. Kiffy interjected and said, "Dia tarik dua and Dia bagi Dua" which means: He took back two and he gave another two. Alhamdulillah. For now I feel like yes right now I have these two with me, but what I pray is that if God wills it then me, my husband and my two kids here will get to go to heaven and also see our two kids who are no longer here in this world, because both of Elhan and Evren's elder siblings are in heaven so I really, really hope that all of us will be reunited in heaven. So that will be our final destination. Heaven. Yes, I am happy to be with my loved ones, the gifts that I'm blessed with, my kids and my husband here in this world but this life is temporary, also the life here is filled with ups and downs, sometimes pain and suffering too but over there in heaven, there's none of the bad things. So, I want that. I really want that to go to heaven and reunite with my children. May we reunite with our loved ones, our children, family, friends, all in heaven. Say Amiiin to this prayer please and may we all work even harder to go there. And then his fifth and last question: "after going though a lot of process in life, and having the strength that you have, what is your superpower if you can share?" I answered there are things that I can share, there are things that you can't for some reasons or the other. All praises to the Almighty, I think I have been blessed with patience. All strength comes from Him. My name is Sabrina and it comes from the Arabic word Sabr which means patience / the patient one. Sabrina means our patience and if anyone calls me Sab it actually means patience and when people call me that its like a prayer for me to be more patient. People say that our names are a prayer and I think a lot of people have been praying that for me so I'm thankful for that. So, I think that is my superpower, maybe? I ended the interview with their tagline "I'm a superwoman, what is your superpower?" So maybe if you're read this post you can share with me on the comments below as well. It was such a surprising direction of the interview which I didn't expect at all. I went to the shoot not really knowing how its going to turn out and it was such a casual interview - I went on my own and even did my own make up. Here's a link to the online feature of me "PEDIH, RINDU AKAN SEBUAH KEHILANGAN SUKAR DIGAMBARKAN" - Raja Nadia Sabrina (click this title to read) it is a different write up from what they wrote in the magazine issue, I've shared some photos here but will probably will share another post on that as this one is more focused on the online feature as well as the video interview they did. 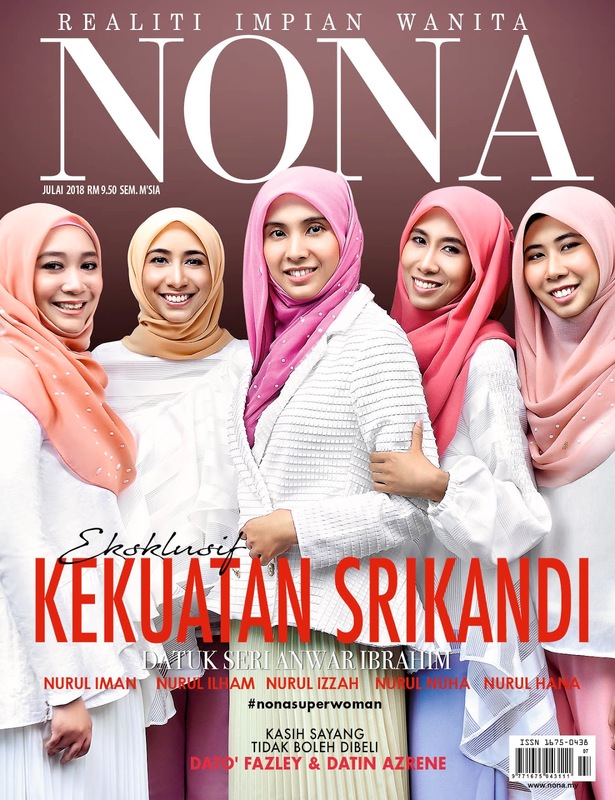 I'm wearing clothes from aere's FAITH collection for all the looks and coincidentally in the same issue, Nurul Izzah, Nurul Nuha, Iman, Hana and Ilham are all wearing aere's CHANGE collection on the cover of Nona Magazine. Orang yang tinggi darjatnya, lebih tinggi dugaannya. I like that despite all the worldly things that you own that I see on you in social media, you didn't mind to share your experience, your story on what you think don't have/losses and pain you gone through. May Allah bless you and your loved ones. Adalah dimaklumkan bahawa Ahmad Fariz Bin Abdullah bukan lagi kakitangan D'Aura Group Sdn. Bhd. dan tidak boleh melakukan apa-apa urusan bagi pihak syarikat. Please be informed that Ahmad Fariz Bin Abdullah is no longer a staff of D'Aura Group Sdn. Bhd. and is not allowed to do any business under the name of the company.